I would like to adopt a Whippet - age or gender not important. I have been a companion to Whippets for more than 30 years. I have primarily lure coursed my Whippets, but have also shown them in AKC and IABCA conformation. Several of the Whippets I bred were trained and placed as service dogs. I am widowed now and only occasionally course my rescued Whippet and Greyhound. Any dog I get will be neutered or spayed, if not already. I live by myself on 5 country acres, with my current four dogs. Emi Greyhound age 3, Fletcher Whippet age 4, Maggie Golden age 7-8, Teddy Welsh Terrier age 7-8. All of these dogs are rescues - Maggie and Teddy were found abandoned near my home in cold Decembers. No one answered any of my ads for them. Emi came to me at 4-1/2 months old from a Craigslist ad. I am her 4th owner since she left the breeder's. Fletcher was surrendered at a doggy daycare in Des Moines. He came to me at 20 months as a very anxious dog. Training for lure coursing has made him more focused and less anxious. He and Emi are BFFs, though all my dogs get along well. I have fenced property - the dog pen is about 1/3-1/2 acre with a 6" fence. I live about 90 miles north of Minneapolis-St. Paul - about 90 miles south of Duluth, MN. Please let me know if you amy have a dog for me! I will consider a long-term foster or dog-share and terms for showing or coursing. 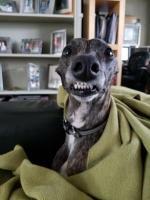 Hope you find your whippet, your house sounds like a dog paradise!